Set new fashion standards by wearing this shrug from the house of Juniper. 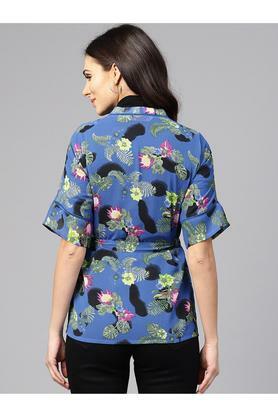 It features a floral print pattern that renders it trendy. Moreover, it has been crafted from superior quality poly georgette fabric, which not only provides comfort but also makes it easy to maintain, while the short sleeves add to its design. Be the style icon among your friends by wearing this open front tie up shrug, which has been crafted with care. Wear it over a top along with a pair of jeans to complete your casual look.